Artist’s depiction of a wind-assisted tanker at sea. The companies presenting are looking for “…strategic partnerships and shipowners interested in game-changing fuel-saving technologies,” according to Shipping Innovation Fast Tracker (ShIFT), a joint venture between the Carbon War Room (CWR) – an advocacy group and think tank most closely associated with Richard Branson, and UCL. The focus on shipping is not surprising for CWR, especially with its stated objective of “accelerating the adoption of business solutions that reduce carbon emissions.” Within its Transport Group, its Operation Shipping Efficiency aims to encourage investment, development and installation of energy efficiency technology to improve the efficiency of the fleet, by providing transparent data to the wider market. Solutions for lowering fuel costs have their roots in sail power, the same technology that pre-dated diesel power up until the early 20th century. Turbosail, a company founded by Jaques Cousteau and one of the presenters, utilizes a device similar to an airplane wing turned upright on the deck of a ship, where a vertical hollow tubes, takes in air and create a pressure differential (resulting in lift and drag). In the mid 1920’s, a time that sail had been supplanted by steam powered engines (with diesel already gaining share), the phenomenon where a wind blowing on rotor can be converted into forward thrust, known as the Magnus effect, was harnessed on a schooner. This became the Flettner rotor, named for an engineer specializing in the nascent world of aeronautics. In 2014, the rotor concept is arguably ready for prime time. Rhodes explained that the Magnuss VOSS is a vastly improved version of the original Flettner design, whereby wind hits the rotating hollow cylinder passes on two sides, setting up a high and low pressure differential. The sail is a 100-foot tall spinning, hollow, metal cylinder that propels a ship, somewhat like a conventional sail, but with as much as 10 times the efficiency. Each sail (typically four to five fitted on board) can produce up to 30,000 pounds of thrust, which is equivalent to the thrust of a 737 jet engine at take-off. 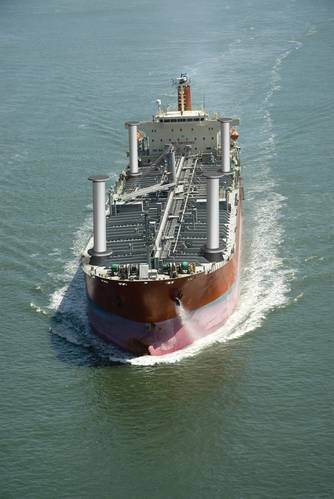 The wind-powered thrust, effective across 290 degrees of wind angle, enables the ship’s main engine to be throttled back while maintaining voyage speed. What makes the Magnuss sail system unique is its ability to fully retract when loading/unloading in port and in unfavorable wind conditions. Panelist Norsepower (offering the standard fixed Flettner rotor) says that its, “…rotor sails can be installed in new vessels or they can be added to an existing ship.” Later this year, trials will begin on a 1999 built Finnish flag RoRo set to begin a charter in the environmentally sensitive North Sea trades. Norsepower talks about 10% to 20% savings. Rhodes, from Magnuss, elaborated on the economics of the VOSS solution, thinks industry can do better. “Under optimal wind conditions, fuel consumption can be cut up to 50% and under typical operating conditions, annual fuel costs can be reduced by 10-35%.” He added that because the Magnuss VOSS is retractable means it produces no drag in adverse wind conditions and therefore produces axiomatically greater savings versus other Flettner rotors or fixed sail designs. 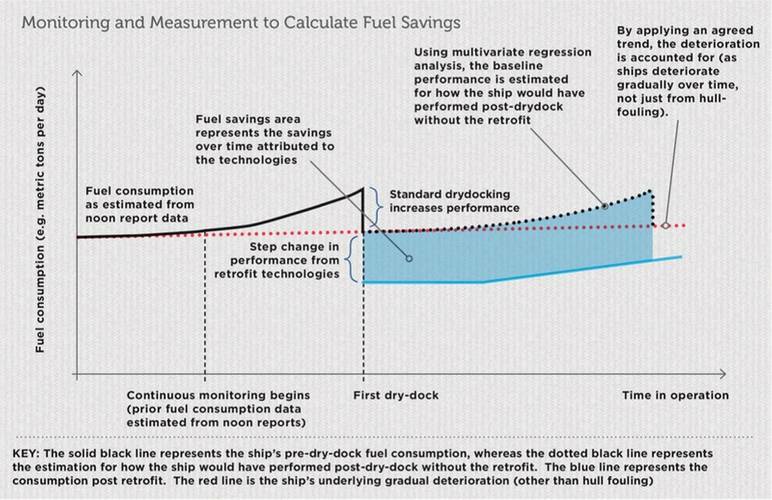 The conceptual diagram (Monitoring and Measurement to Calculate Fuel Savings) shows an overview of benefits (the shaded area) from retrofits of fuel saving technologies deployed during a major dry docking. Graphics notwithstanding, multiple impediments standing in the way of deployment of sails and rotors are identified in a report authored by the Carbon War Room and the UCL Energy Institute in June 2014, “Hidden Treasure: Financial Models for Retrofits.” In the report, major gaps facing fuel saving technologies (including wind assist) that need to be overcome are identified. These difficulties include technical, operational and financial issues. The difficulties are not insurmountable. Underscoring that claim, and beginning in late 2012, Magnuss collaborated with a leading mover of commodities, Rio Tinto (also a large vessel owner). Wind assist is creating other opportunities for maritime technologists. Progress must be made on developing accurate reliable hardware and data transmission protocols for quantifying and verifying the much discussed, but elusive “savings.” Improved measurement devices and monitoring devices must then be interfaced with equipment that will seamlessly (and securely) transmit reliable readings into large-scale databases. Such data will be required, especially for proponents of so-called “big data.” Nevertheless wind assist advocates are hardly starting from scratch. Existing remote data gathering and transmission supporting condition based engine monitoring may prove useful in providing streams of reliable real time fuel savings information. The effort to fund emerging technologies faces multiple obstacles. Mechanisms to bring in outside financiers, whose payback is integrally tied to (reliably measured) fuel savings, must be prototyped. 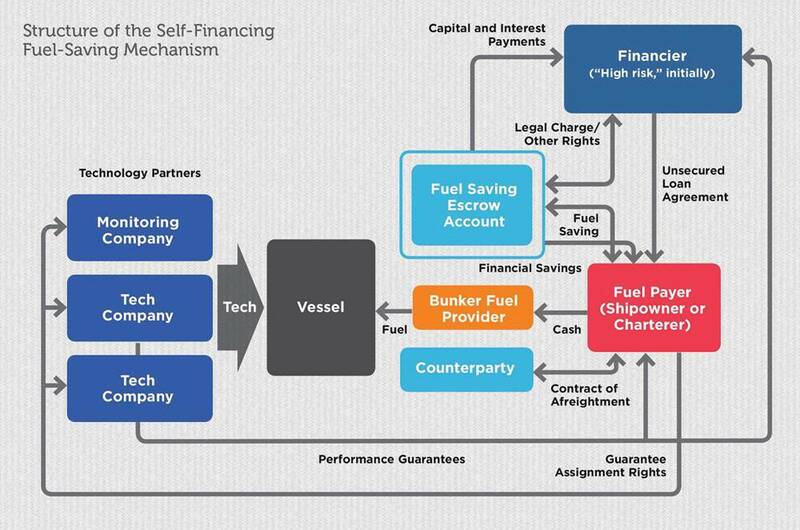 The Financial Flow chart depicted below shows the importance of accurate measurement of the fuel savings, where repayments of debt service (capital and interest) to the financier flow through an “escrow” account that is continually topped up with real hard cash generated based on fuel savings. Other wrinkles are in the province of financial engineers (rather than naval architects). Consider what happens when fuel prices drop, as they have in late 2014 without a series of transactions akin to a hedge to lock in the savings, in effect. One model to consider might be an insurance product developed by another group, The Global Innovation Lab for Climate Finance, which would protect against less than anticipated savings. Ship chartering transactions also present challenges, for example where an underlying owner installs the fuel saving technology, and then puts the vessel out on time-charter, or bareboat charter, to counterparty. If the increased charter rate (in $/day), resulting from more economical operation, does not fully match the fuel savings, then financiers will face a shortfall as they pull in cash. Nevertheless, ShIFT points out that considerable inspiration can be found in the solar power industry, where such documents underlie funding of capital expenditures.